The highlight was an interview with Genna Sosonko, one of the tournament commentators and a near contemporary of Tal, who expressed the opinion that if Tal (1936-1992) had been born 15 to 20 years ago he would never have become a professional chess player. On the remaining boards the struggle was in full swing, when suddenly the game broadcast went down. Apparently the voltage in the whole of GUM jumped, we were told, and a stand-alone circuit breaker couldn’t be found. The press centre was plunged into darkness, figuratively speaking i.e. there was as much light as you needed, and electricity, and Zenit St. Petersburg in far-away Siberia were beating their opponents with the hockey score 5:2, which every journalist could find out from the screen of their laptop, but what was going on behind the next door, of that we had no idea whatsoever. I left the press centre and took a glance into the playing hall. The same story. The stage was high and far-away, you could only see the most general outline of the pieces, but not the position at all; while the monitors had frozen as in the fourth installment of “Die Hard”, which had, you’ll recall, the subtitle: “Meltdown”. For the umpteenth time I was overcome by nostalgia: for large demonstration boards, for pieces with magnets and hoops. Do you remember that? So it was easy for them to be picked up by the large sticks that the demonstrators handled no worse than professional billiard players handle their cues. While the demonstrators themselves were impassive and therefore seemed so important and, moreover, they were terribly slow: the grandmaster on stage had already long since made his move, while this man would at first walk up unhurriedly, then write down the move in his special little folder and only then take up his stick. The stick catches hold of the c8 bishop – and your heart immediately stops: where’s it going? to b7 or g4? While the rook, that normal rook on f8, you know it like the back of your hand, that rook from castling short, it’s now going to move into the centre, to e8 or d8, and you’re waiting for it there, but the demonstrator suddenly picks it up and drags it down, down, still further down, where on earth is it going? And suddenly it takes the pawn on f2 , and you break out in a sweat: a combination! And the hall hums, hums, and one of the most impatient fans jumps up, thrusts out his arm and shouts something, but not to the grandmaster but again to the demonstrator, as if to say where are you putting it, do you really not see it’s en prise! and that fan’s friends drag him down by the tails of his jacket: sit down, chill out, it’s a combination, you fool – and the whole company leans over small portable magnetic chess sets, which, of course, they brought with them, and putting their heads together they begin to go over the variations, occasionally throwing back their heads and checking – again, with the demonstration board. But what can you say. That’s no longer just sailing off into the sunset, but long since sailed. Perhaps that’s why there are so few children in the hall – as the magic has gone, and only bare technology is left. And now technology itself is letting us down. The players in our tournament, almost all of them, didn’t know him personally. 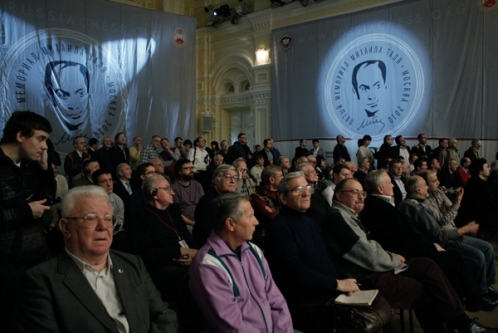 But one or two of them saw him: Boris Gelfand played a tournament game against him, Volodya Kramnik played him at blitz, Alyosha Shirov studied with him – they remember the very old Tal. But in the beginning everything was completely different. Misha was twenty or twenty one when he soared to the top. This was a man who, entering the playing area, would greet not only the arbiters and the arbiters’ assistants, but also the demonstrators – shaking their hands. Imagine Federer and Nadal going onto court and shaking hands with the ball-boys, the line judges and so on. This was a man from a different world, with different ideas. He came to each game as if it was a celebration. Chess for him was a celebration. His style, his relation to the game, they made him what he became. Yesterday I walked along the banks of the Moscow River. I saw, as before, the Variety Theatre, and I recalled, of course, the events of half a century ago. I’m not talking about the bank having being packed, that goes without saying: enormous boards stood at the entrance to the theatre, and cars would stop on the opposite bank. People got out of their cars, looked at the positions – now it’s hard to imagine that. Of course, there was a full house for every game. The hall was overflowing. Before Tal beat Botvinnik he’d won everything in succession. He’d twice won the Soviet Championship – there’s no need to list the names of those who played there; then the Interzonal tournament, the Candidates Tournament and, in between, a strong international tournament in Zurich. For two years he’d simply beaten everyone! I’d compare him to Vaslav Nijinsky, the legendary ballet dancer from the last century, who had a phenomenal leap. When they asked him: “Vaslav, how do you do it? !” he replied: “I don’t really understand the question; everyone leaps up, but they immediately come back down to earth, but why – after all, it’s so pleasant to soar above the earth for a while”. You can say the same about Tal’s play: he took off and with his flight he proved to everyone that he’d entered a completely different category. Enemies? I don’t think he had any. “Enemy” is too strong a word; perhaps some envied him, but – and I keep returning to this – how can you envy, for example, Leonardo? Of course, you have to note that when we say “Tal” we have in mind two chess players, and not one. The first beat Botvinnik and shone for a few more years; the second appeared later, after Karpov’s matches with Korchnoi: the omniscient Tal, with a long unbeaten run and excellent endgame knowledge – while the previous Tal had said: “Why should I understand the endgame? If I get into an ending then no doubt I’ll have an extra piece, and I’ll win with that somehow or other”. That second Tal was also, of course, a wonderful grandmaster, but it’s just that he had nothing whatsoever in common with the first. It’s absolutely clear to me that if Tal had been born fifteen years ago, or even twenty, he would never have chosen to play chess. It’s a completely different game from that game that Misha played. There’s no need to add that it stopped being “that game” because of computers. It’s no secret for anyone that grandmasters nowadays switch on very powerful computers before each game and check lines that they’ve already looked at before. They do it again, and then again, and yet again. That process can last an hour, or two, or three. I don’t think any sort of exception will be made for the rest day. The variations have a huge number of branches. They last heaven knows up to which move. You need to remember it all: on that move I make that move, and on that move – that move. Without cramming contemporary chess is impossible, and I’m absolutely sure that such an occupation would have been boring for Mikhail Nekhemevich. Simply boring, intolerably boring in itself. I’m not saying that in order to warn young chess players off the profession. What I’m saying also isn’t something positive or negative, there’s no plus or minus. It’s just reality. 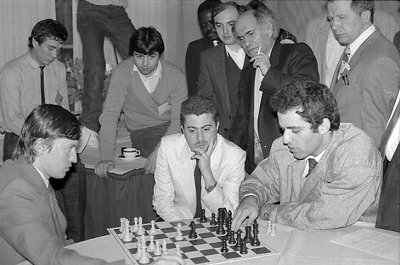 A good memory, well-developed computer skills – those are facets of contemporary chess. And they lead to another problem. The majority of players at the Tal Memorial have brains that are so clouded (clouded by their preparation work with computers), that the learning process backfires on them. Where does knowledge end and your own play begin? The answer to that question brings us to the conclusion that the difference in the quality of moves made when knowledgeable and those made when “ignorant” is colossal. That’s the problem of contemporary chess, the problem of chess players at the very highest level. 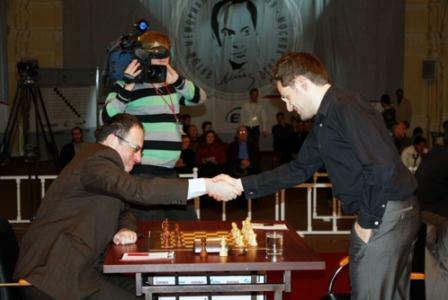 The Aronian – Gelfand game. White unleashed the novelty: 12. Nh4. Does it win? No, of course not. But within ten moves, perhaps slightly less, we saw that as excellent, subtle and pure a chess player as Boris Gelfand had a lost position – with a knight on a8 and pieces that you simply couldn’t look at. Within ten moves he had a lost position: how on earth did that happen? It’s the effect of the novelty. I remember Tal’s commentaries and the chess of that time. Of course back then grandmasters also came up against novelties. However, they realised: yes, my opponent could have looked at the position himself or with his second, but that doesn’t yet mean anything. He might have miscalculated, this opponent. Very often – in Tal’s games as well – meeting a novelty he’d think for forty minutes, an hour, as long as necessary – and then either neutralise the novelty, or totally refute it. In other words when you faced a novelty it was unpleasant, but not fatal. Now though, when you come up against the move Nf3-h4, and it’s played very quickly, you realise that it’s not some sort of improvisation, it’s not something that he’s had a hasty look at – you realise that you’re up against some computer work. You’re competing with a computer. And the effect of that painful awareness is four times, five times, or ten times what it was in Tal’s time. 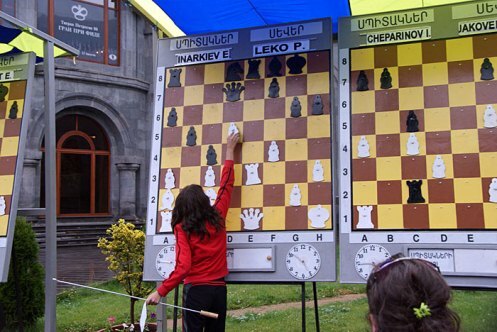 The Aronian – Kramnik game. We all understand what happened. And after all it’s not the first time for Volodya. In Dortmund he also lost to Ponomariov in the same way. He made moves, he didn’t like something, but as he explained himself, he knew for certain that he was following his analysis. And he believed that at the end of the line he’d find a move after which White had nothing. That’s how it panned out, but when they got to the crucial position he realised: it’s bad, really bad! And after the game he discovered that the position wasn’t quite the one he thought, one piece was standing on the wrong spot. I remember when I played at the professional level myself, at tournaments of the rank of “Interpolis” and Wijk-aan-Zee. You told yourself: that’s it, now any definite knowledge is over, the position’s no longer familiar – play! But in my time there weren’t yet computers, and analysing everything was simply impossible by definition. Now though, when there’s both the temptation and the possibility of analysing everything completely, of going as far and as deep as possible – it can play a negative role on the practical strength of a chess player. I’ll answer in two ways: in those days people didn’t always refute novelties, and now they don’t always collapse. It’s true, however, that nowadays the novelty is objectively the strongest stage of the game as a whole, if accurately checked by a computer, of course. Something else is interesting here. Vaganian said that when he was young it wasn’t considered the done thing to win a game according to your home analysis. Even if it did happen the players would try to hide it, to pretend to think, camouflage the analysis and so on. While people now, for the most part, are proud: yes, I had it all written down to the 33rd move. I played according to the first line! The computer, of course, has emasculated chess. The second fetish is rating. Everyone keeps babbling on about it: rating, rating, but rating of what, it’s not clear at all. Chess has become more professional, it’s hard to argue with that. Preparation, again. In Tal’s time people played differently, of course. There was a different attitude both in chess and to chess as a whole. I was recently re-watching the old Soviet film “Beware of the Car”. The lead character there is returning from a trip and his mother tells him the latest news. She says: they’re going to start delivering milk, something else, and then amongst other things: “You know, Korchnoi won the tournament. I was really rooting for Tal! But he finished half a point back”. That stunned me. What I mean is that the times now are a little different. Now it’s unlikely that in a film you’ll hear: she was rooting, say, for Voldya Kramnik, but Aronian won. Although if Kramnik had remembered everything that he’d written down the table would be different. Kramnik would be in Aronian’s place and Aronian in Kramnik’s place”. And I’m entirely in agreement with him on that. Three of Genna Sosonko’s books have actually been translated into English and I’ve put them in the Amazon “carousel” on the right. I haven’t read them yet, but I’m inclined to trust Odessky. If you click through from here I’d get a small percentage commission on any purchases (you just need to “add to basket” after clicking through the link and can buy later), which would be a great help in almost justifying the time that goes into this site :) It should also work if you buy anything else, not just the books linked. The sidebar links are for Amazon.co.uk. For US readers there’s a small Kindle link in the footer – so if you click through there the same should apply (I can sign up for the French or German Amazon just in case anyone was planning on making lots of purchases!). Obviously there’s absolutely no obligation to do any of that, but if you’ve enjoyed this site it’s a way of supporting it at no cost. p.s. of course simple donations are always welcome (see the ugly orange button at the top of the page!). 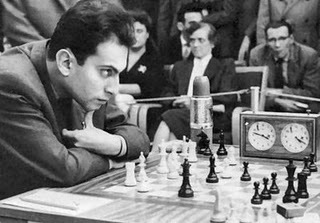 Wonderful article on Tal and the past and current states of chess. Thank you for the fluent translation of valuable chess lore. Fantastic stuff from Odessky at the beginning. Eager to hear more of his nostalgia’s…. You could come up with a list of articles/columns that you think people might be interested in (maybe some OLD stuff; russian interviews from maybe over 20 years ago or so). List the title and potential content (which you can determine at a glance) and put in an amount of money (based on time) it would take for you to translate the whole article. If sufficient people are interested…. well, you might be able to get a decent income. You could then only mail the payers the article; and put it up on the site where viewers can view it at a small price based on the price you quoted. A percent of the money you get from viewers can go back to the payers (till they’re paid back fully, if the article’s a hit). And once the payers are paid back fully, you could publish the article for free. Am i sounding drunk, or is this logical? Dunno. Sorry. Of course the initial search for articles might be difficult; but you could have friends (Shipov?) who could point you to some old masterpieces from memory. Thanks for the info on the button! I ran the site through this: http://browsershots.org/http://www.chessintranslation.com/# (and got a minor shock) so you probably have one of the browsers where the button’s not visible. Of course it would be better if it worked properly everywhere… (probably some issue with CSS styling!?) I might change it, or perhaps the easy thing to do will just be to add an extra button in the footer (where I had it before). The idea about the translations is interesting – actually I was thinking that e.g. it would be interesting to produce an eBook of all of Odessky’s Tal Memorial reports translated in full, and to offer that for sale (something like an old-fashioned tournament book). Of course the moment money’s involved I’d have to arrange things properly so that the original author would get paid (assuming there was any profit). Probably I won’t do anything for now, but maybe in future… you’re right about old interviews, by the way. I saw some great old Yury Vasiliev interviews with e.g. Kramnik (before the Kasparov match). That said, I basically want to keep the site free – any paid translations would be something extra. 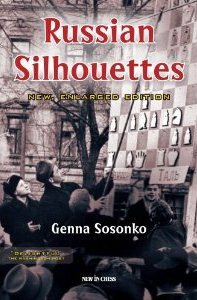 I’ve almost finished reading Russian Silhouettes, and it has been a joy to read. I only have the article on Levenfish left. I plan to order the other books soon. Another was Tal saying ‘calmness is my mistress’ when he would get into time trouble playing blitz.